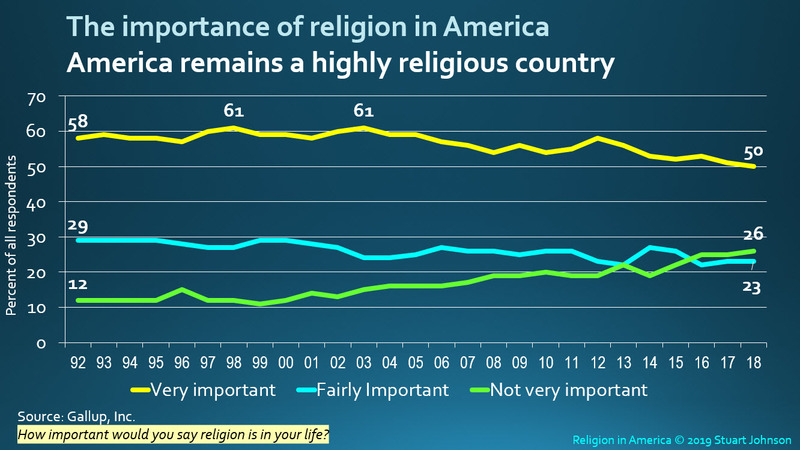 About Religion in America. In 2012 Stu Johnson was the lead author of a report on the Religious Publishing Marketplace in America, produced by Simba Information for Zondervan/HarperCollins Christian Publishing. 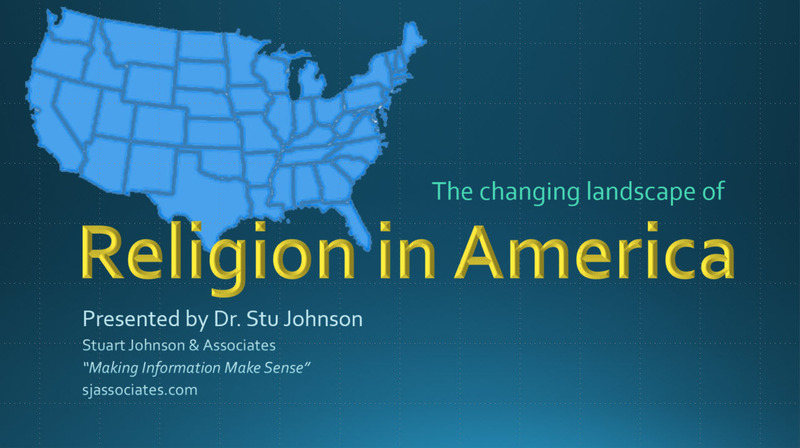 The chapter on Religion in America, a summary of survey research, some of it going back many decades, was compiled solely by Stu and subsequently extracted as a separate report. Notes: The primary data sources used in our research include Gallup, the Pew Research Center, and Barna Group. Data sources are shown on each chart. For some charts, the survey is conducted annually, others more sporadically, Each chart shows the latest data available at the time of the last update of this page. Get a PDF version of this report (layout is better than using the Print option on this page). Major observations with this update. Charts have been updated to include 2018 data from Gallup trend reports, where applicable. In the U.S. the number of Christian adherents continues a slow decline that became noticeable around 1970. Those claiming Christian affiliation (Protestant, Catholic and non-denominational Christians) accounted for 93% of the adult population in 1964. It was 67% in 2018. Meanwhile, those claiming no affiliation have been steadily climbing toward 20%. 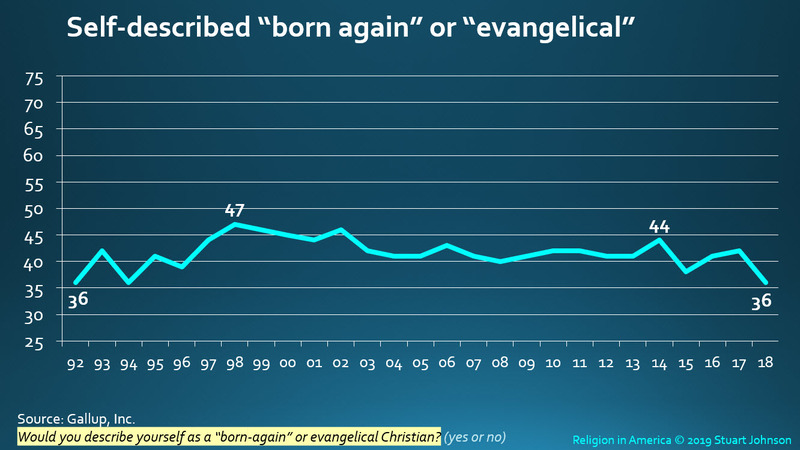 While Christian adherents are declining in the U.S., those who describe themselves as "born again" or "evangelical" remains above on-third, but is trending below the 40-percent mark, where it had been most years since 1993. (The 36% of 2018 matches the number for 1992, the first year this measure has been tracked. Breaking the numbers down, it appears that most of the loss in Christian adherents is occurring among those who might be identified as "cultural" or "nominal" Christians, whose adherence has been driven by tradition more than belief and practice. This is clearly seen in the shrinkage of mainline denominations. 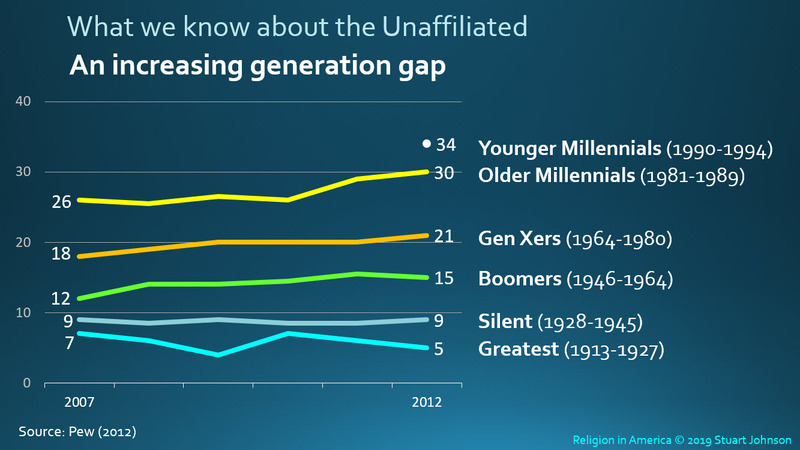 The significant rise of those who claim no affiliation—especially in the United States—has been accelerating since 2000 and is most noticeable among the youngest generations. A study in January 2018 by Barna, which includes 13-18 year-olds in Generation Z, shows a doubling of those identifying themselves as atheist (13%, compared to 6-7% for all older cohorts, including Millennial and Gen X). Americans have shown a steady erosion of confidence in major institutions tracked by Gallup since 1973. Organized religion was number 1 from 1973 through 1985. Even though it remained at number 4 in 2018, organized religion has lost more ground than any of the other 15 institutions included..
Globally, Christian adherents represent the largest group, followed by Muslim, Unaffiliated, Hindu, Buddhist, and Folk Religions. By 2050, a Pew study projects that Christian and Muslim adherents will virtually reverse their positions, with Muslims as the largest global group and Christian in second place. While Christian adherents have been declining, especially in the last two decades, the United States remains a predominantly Christian country—with 67% of adults identifying themselves as Christian in recent surveys conducted by Pew, Gallup and others. Around the world, according to the World Christian Database, Christians represented one-third of religious adherents (31.4%) in 2010.. While Christian adherents are expected to dominate in the United States into the foreseeable future, by 2050 Pew predicts a drop from from three-quarters to two-thirds of adults. In fact, we reached that level in 2018, according to Gallup. Non-Christian adherents in the U.S. will increase some, but the most noticeable shift will be the continued increase of those with no stated affiliation. 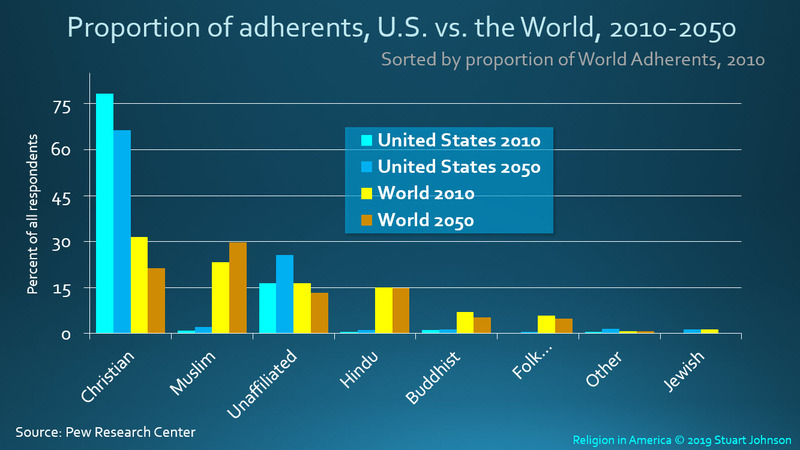 However, when looking at global projections, notice that Muslim adherents could become the largest segment by 2050, most most others, including unaffiliated, staying the same or declining. The previous chart was updated to show 2014 data for the U.S., so it is different from this chart, using 2010 data. For much of the 20th century, Protestantism dominated the American religious landscape, with its adherents representing 70% or more of the adult population. 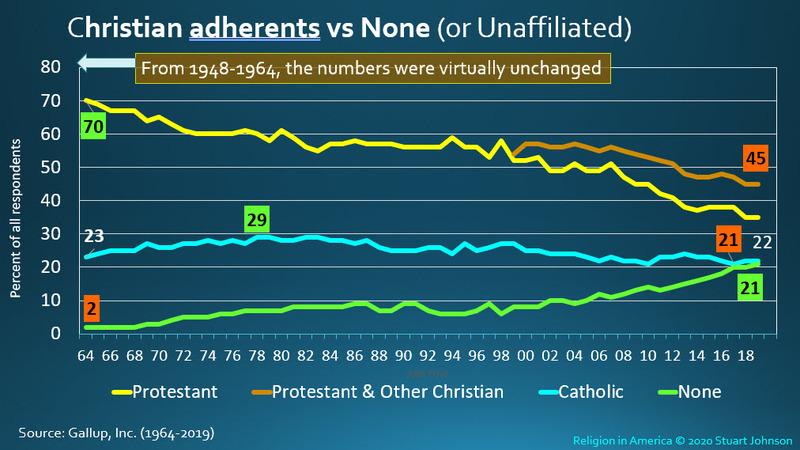 Catholic adherents accounted for another one-quarter of adults, putting the combined total of Christian adherents well over 90% for many years. Following World War II, Protestants and Other (non-Catholic) Christians declined from a steady 70% majority to just below 50% for the first time in 2012, according to Gallup. Catholics have held steadier, at roughly a quarter of the adult population, but show a steady decline from a peak of 29% in 1982 to 22% in 2018. The 2018 data shows an interesting quirk: the Catholic and None lines appear to cross, but Catholics had a slight reversal and None held steady at 20%. "Nones" have been steadily growing from practically non-existent status in the 1960s to breaking 10% in the first decade of the 21st century, then approaching or exceeding 20% in the second decade, depending on the survey. Initially, this reflected a rejection of organized religion, with some "nones" remaining spiritually open. More recently, however, especially among younger generations, we are seeing growth in those who identify as agnostic or atheist. (See the charts on Generation Z below). 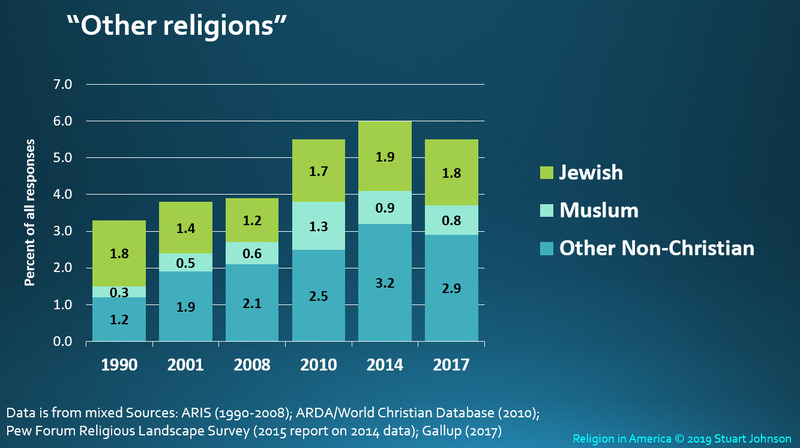 This chart was added to the report with this update, primarily because the trend that has been developing since 2000 is so obvious (and corresponds to the "rise of the nones" discussed throughout this report). This is the longest-running of the Gallup questions on religion, going back to 1945. 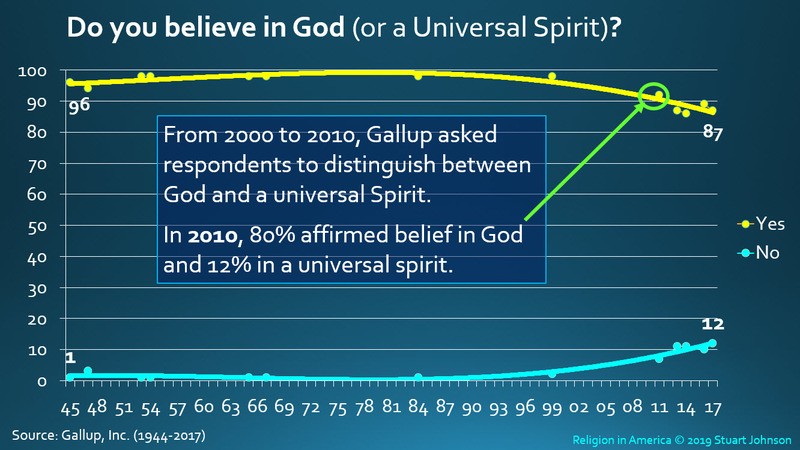 As you can see, belief in God was nearly unanimous from the end of World War II to the last decade of the 20th century. Since then, it has begun to erode noticeably. When first asked, the question referred only to "God," but in more recent years has used "God or a Universal Spirit." The proportion affirming this identification peaked at 47% in 1998, with the trend curve starting to move gently downward after the turn of the millennium. Compared to other indicators with far more significant change, the trend here is remarkably level. At the beginning and end of the chart there are a number of seemingly significant swings where the number bumps up one year followed by a dip the next. While such swings can be attributable to specific factors, they can also be amplified by the margin of error and rounding of results to whole percentages. Interestingly—but not conclusively—the peaks in 1998, 2002, 2006, 2010-11 and 2014 all correspond to mid-term elections. In my opinion the term "evangelical" has been corrupted by its common use among news media to refer to a religiously conservative voting block, confusing its theological meaning. While the number noticeably peaked in 2014, it reversed course in 2015, then rose more modestly in 2016 and 17, before diving to 36% in 2018, exactly where it started in 1992. 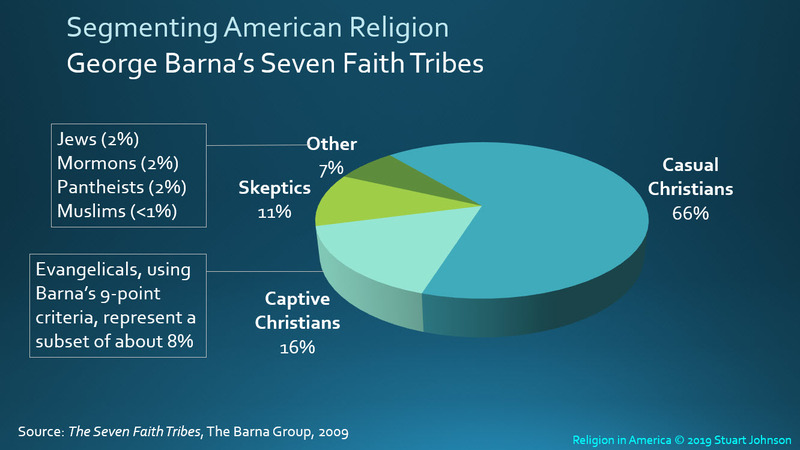 * Barna uses a strict definition of evangelical, based on beliefs and behaviors, that narrows the group down to about 8% of the adult population. Beyond those who fit this narrow definition, a third or more in Barna surveys have described themselves as "born again." The data comes from different sources. Because the numbers are small (with the error of margin for most surveys), we can only make a few general observations. Clearly, there has been some increase in Other religions, yet they still represent a very small portion of the adult population in the U.S., between three and five percent. Jews have remained between one and two percent in surveys since 1990. Muslims adherents remain a smaller segment than many people might assume, given exposure in news and politics (and confusion between religion, ethnic background, and national origin). The growth shown by 2010 seems to have settled back to just under two percent. 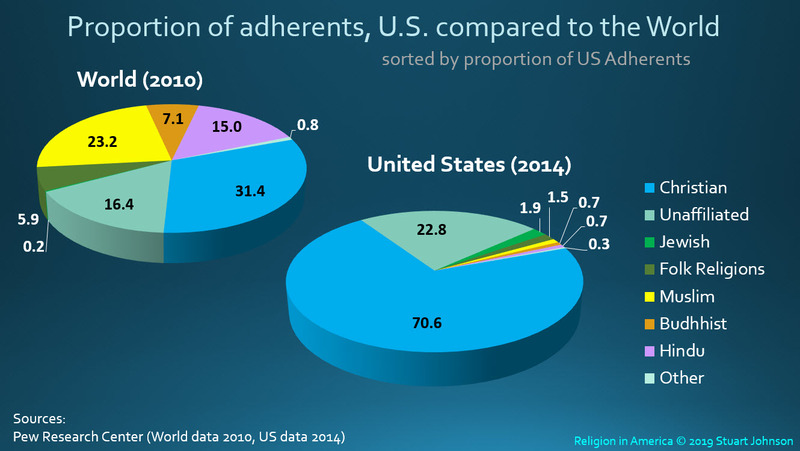 Adherents of Other non-Christian religions (which represent many groups) are growing, up three-fold since 1990, and greater than the combined total of Jews and Muslims. Prior to 2018, a breakdown of those who claimed no religious affiliation showed some growth of those who identify themselves as atheist and agnostic, but the greatest growth was among those who simply have no preference. The presence of the seemingly paradoxical "religious unaffiliated" is an indicator of the discomfort that a number have with organized religion. (In 2008, Pew found that when Unaffiliated were asked a number of questions about spiritual issues, they could be divided between Religious—those who claim that spiritual factors are important to them—and Secular—those who claim little or no importance for spiritual things). 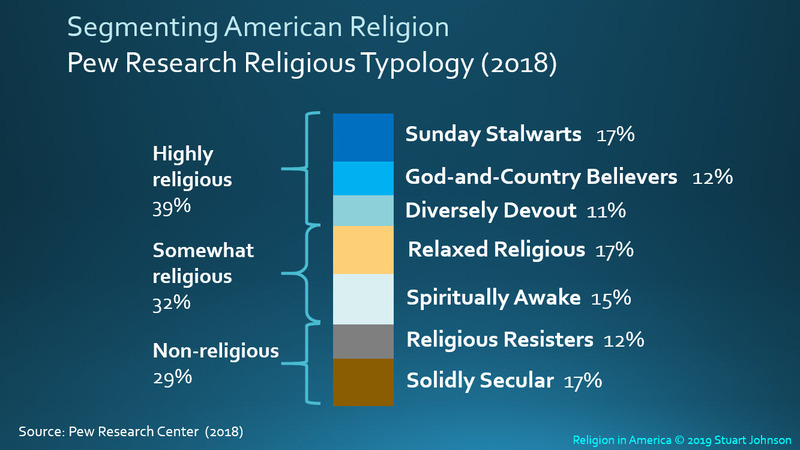 It appears that the those with spiritual interest are on the decline, however, most moving to secular unaffiliated rather than directly to atheist or agnostic, which remain between six and seven percent combined. When viewed by generation, it is striking to note the accelerating growth of the unaffiliated with each succeeding generation. The proportion moves from 10-percent or less unaffiliated for those born before the end of World War II in 1945, to a third of the youngest generation. In a study released in January 2018, Barna Group revealed a startling indicator of the depth of age-related disconnect with organized religion. 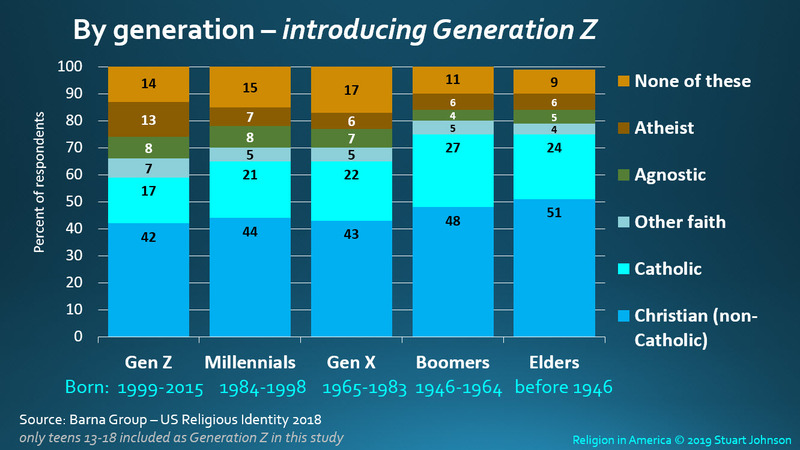 The youngest age cohort, known as Generation Z, or Gen Z, shows a 5-point increase over Millennials in not claiming a religious affiliation. Most significant: all of the increase and more came from those claiming to be atheists. The Barna report reveals much more detail, which was the subject of an InfoMatters blog, "Generation Z," posted in February, 2018. The Gen Z study asked about respondents' views of science and the Bible. In general, younger generations side with science or view science and the Bible as independent, expressing different aspects of reality. 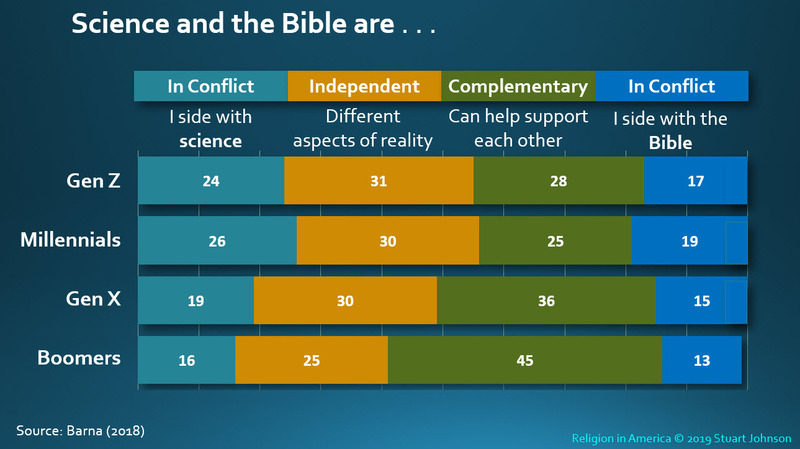 A diminishing proportion see the Bible and science as complementary, while the number who side with the Bible when there is apparent conflict increases with the youngest generations. This may seem counter-intuitive, but could be due to the strong influence among some home schoolers and Christian academies, "young earth" groups and others taking exception with scientific assumptions about the origins of life and the age of the earth. 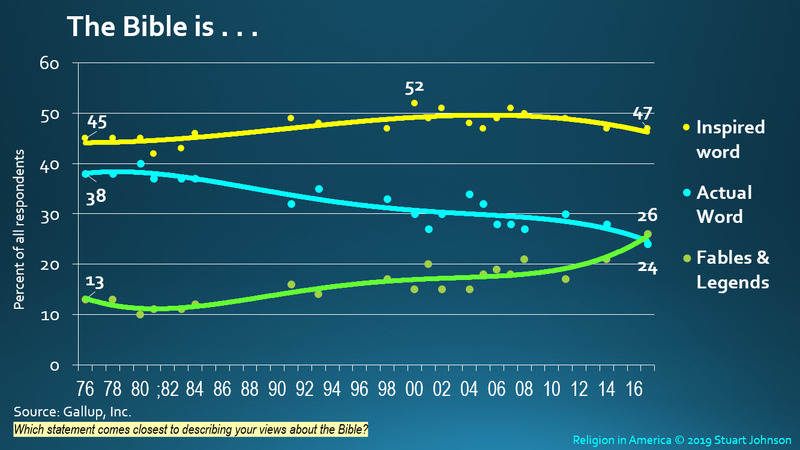 An interesting parallel to the Science and the Bible chart above is data from Gallup on views of the Bible [added to this report with this update]. Both "very important" and "somewhat important" show declines over 25 years"Very important" is off 11% from the peak of 61% in 1998 and 2003. "Fairly important" fell 9% from its starting point of 29%. "Not very important" moved up about 14% in that time, crossing the declining "fairly important" line in 2016. 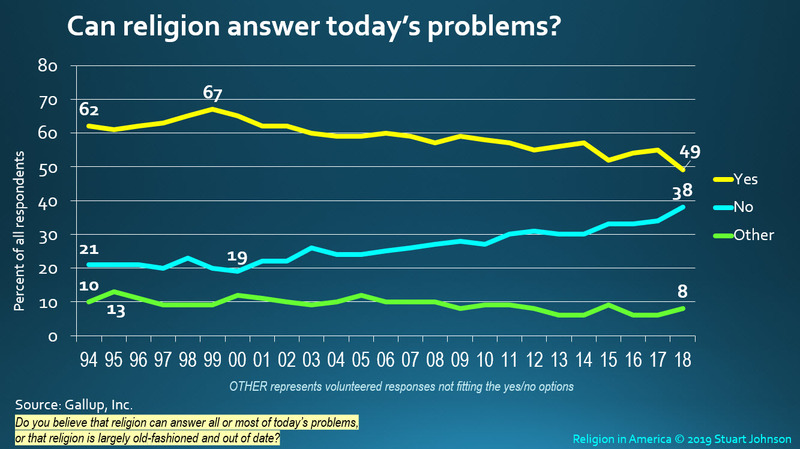 This actually exceeds the "rise of the nones" in the same time period, which went up 10% (some earlier converts to none could have shifted from religious to secular unaffiliated)..
Ability of religion to address today's problems. The decline for "yes" is greater than that of personal importance on the previous chart—a decline of 18% since the peak of 67% in 1999. 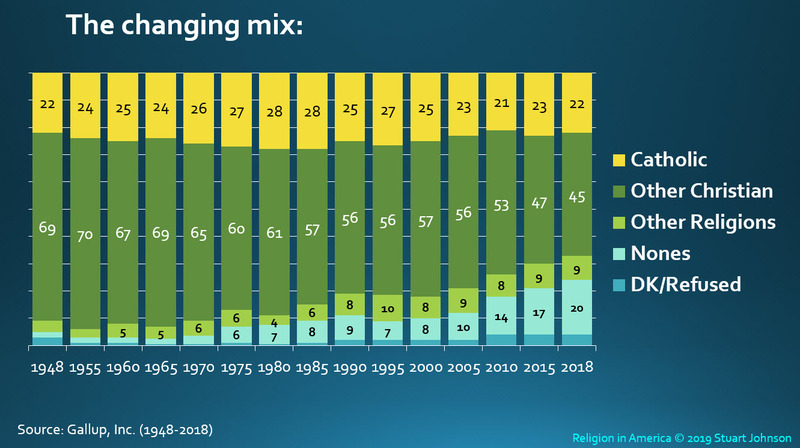 Those who felt that religion "is largely old-fashioned and out of date" ("No" on the chart) rose fairly steadily by 15 points, from 21% in 1994 to 38% in the latest survey in 2018. (This question was introduced in 1994). Here, the change is much more dramatic, with strong belief of increasing influence through 2001 followed by an equally dramatic decline to 2009, when it leveled off in the low 20% area. This is likely due to much more complex cultural and organizational associations than the more personal "problems" question. The trend for "losing" influence is a mirror image given the binary choice. 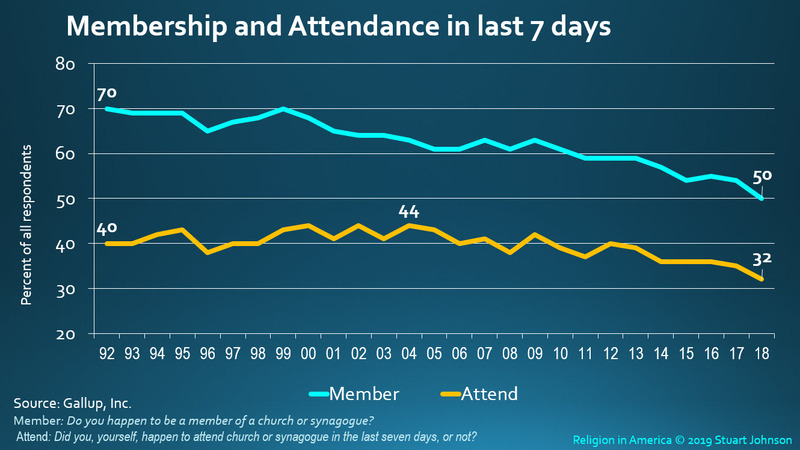 While membership has fallen faster than attendance, the importance of membership (which requires a formal process in most religious bodies) has itself been in decline. Some are content to attend without being official members. Furthermore, while most churches distinguish between members and attenders, it is unclear whether respondents make that distinction. At any rate, it is clear that immediacy of attendance is lower than having a sense of belonging since it declined by less than half (8%) that of membership (20%). . 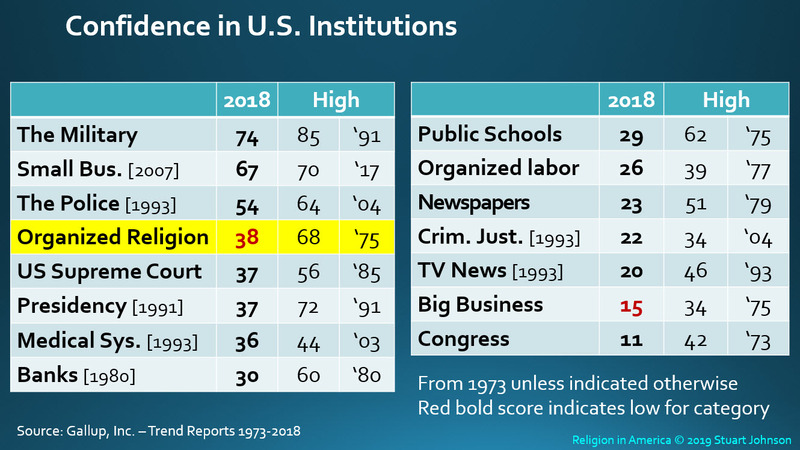 In 1973, the first year Gallup conducted its annual measure of confidence in major institutions, "the church or organized religion" was rated the highest. 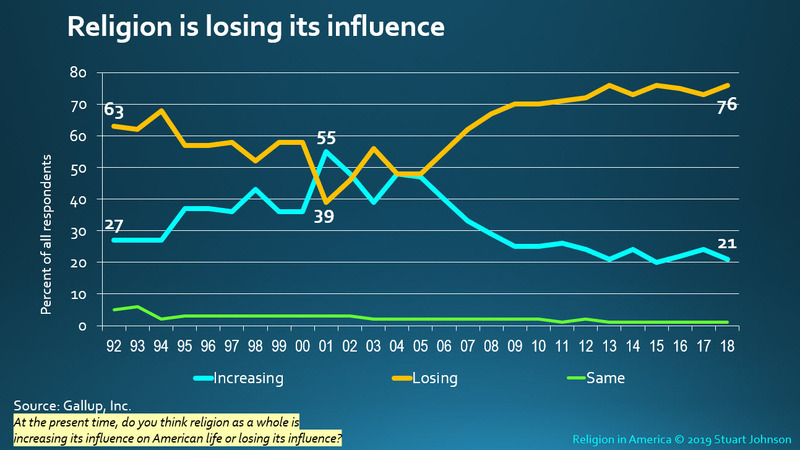 Religion continued to rank first through 1985, then fell below 60%. Among reasons: Televangelist scandals, child molestation by priests; then a general decline in religiosity continued the downward trend (as scandals in Catholic and Protestant churches continued). . 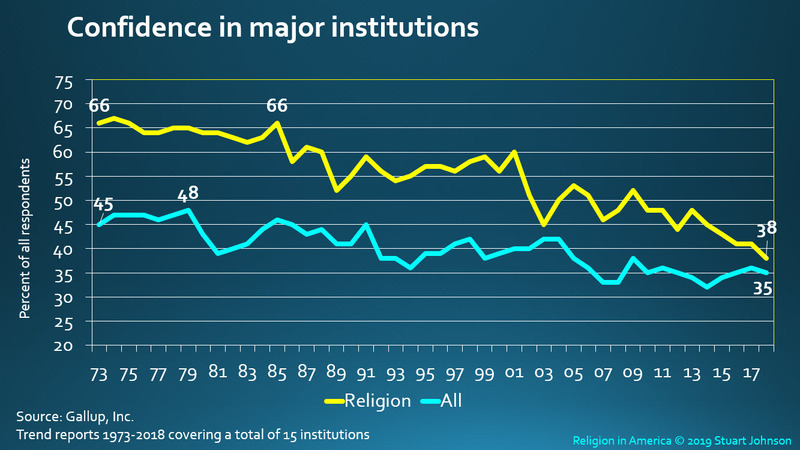 In 2018, religion ranked fourth among 15 institutions, even though it has fallen further than any of the institutions included—its 38% score is 30 points below the high of 68% in 1975. This level of decline should have propelled organized religion much further down the list were it not for the general decline in confidence of Americans in their major social institutions. Nine of the fifteen had the confidence of more than half the population at some point in the past, but by 2018 only three were above 50%, with the rest all below 40%. Organized Religion and Big Business both hit their lowest point since the survey began in 1973. What does the overall decline of confidence say about the future of our society when we have so little trust in our bedrock institutions? What can the Christian church (and other faith communities) do at the individual and local level to restore trust when organized religion itself has fallen so far? Casual Christians (66%) - Rather than allowing the Christian faith to shape their minds and hearts, Barna suggested, they have chosen to fit Christianity within the box they have created for it. One quarter of the Skeptics adopt the label “deeply spiritual” (which is distinct from being religious). Nearly half of the adults in this tribe describe themselves as faith seekers who are unattached to an organized body of faith or theological perspective. [If these seekers represent the religious unaffiliated described by Pew, their significance has gone down dramatically since 2009. Pew Research conducted extensive interviews using a battery of questions that covered a wide range of religious and non-religious behaviors and beliefs. Cluster analysis was used to look for significant groupings that represent the American adult population. Sunday Stalwarts (17%) - Religious traditionalists actively involved with their faith and engaged in their congregation. God-and-Country Believers (12%) - Socially and politically conservative, most likely to view immigrants as hurting American culture. Diversely Devout (11%) - Traditionally religious, but majorities also believe in psychics, reincarnation, and that spiritual energy can be located in physical objects. Relaxed Religious (17%) - Say it’s not necessary to believe in God to be a moral person. Religion is important to them, but few engage in traditional practices. Spiritually Awake (15%) - Few practice religion in traditional ways, but most believe in heaven and hell, and subscribe to New Age beliefs. Religious Resisters(12%) - Most think organized religion does more harm than good, politically liberal and Democratic. Solidly Secular (17%) - Hold virtually no religious beliefs and reject New Age beliefs. 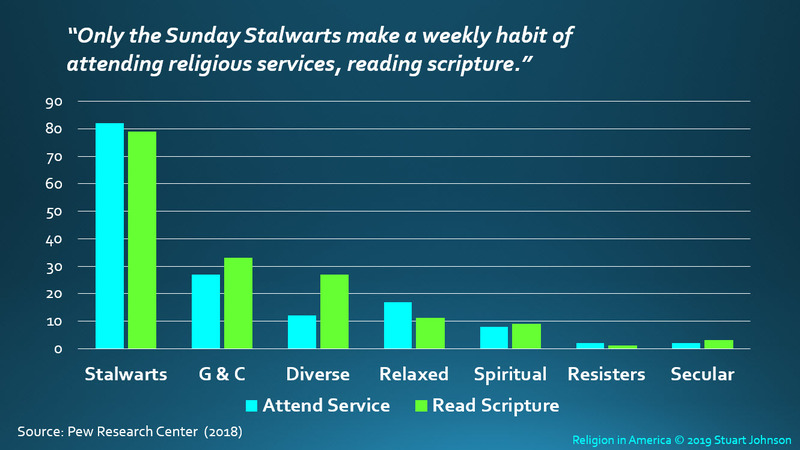 When asked about weekly habits of attending religious services and reading the Bible or other holy book, only the Sunday Stalwarts showed a high degree of connection between faith and practice (both in connection to organized religion and personal devotion). One might expect God & Country Believers to be close behind, but they and all other groups fall off rapidly from this high degree of personal involvement. [T]here is decline—in self-identified Protestants, primarily in mainline churches. Many who once identified themselves as nominal mainline Protestants now identify as nothing. 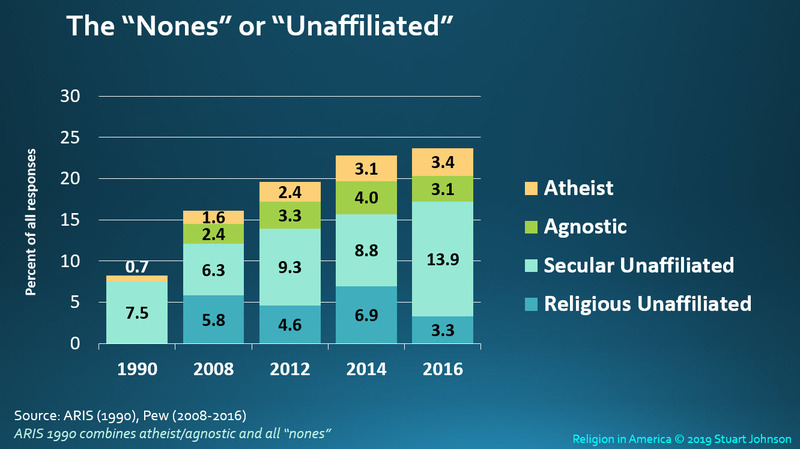 The nominals have become the nones. As such, we see that Christianity isn't dying—cultural Christianity is. . . (emphasis added). Watch for trends and predictions for 2018-19, coming by the end of January. "Generation Z" - (February 16, 2018) - Stu Johnson summaries the Barna Group study on what could be the first pots-Christian generation in America. "Religion in America 2017" - (January 18, 2018) - Stu Johnson summarizes the top ten research articles reported by the Barna Group. "Religious Trends and Predictions 2016-17" - (January 5, 2017) - Stu Johnson reports on observations about 2016 from Gallup and Aaron Earls, and predictions for 2017 by Aaron Earls. "Changing Views of Christianity" - (March 1, 2016) - Stu Johnson summaries a new report from the Barna Group, "Five Ways Christianity is Increasingly Viewed as Extremist," and takes a look at several historical trends that may help explain how we got to this point. "Trends in Religion 2015" - (December 17, 2015) - Stu Johnson summarizes the top-10 trends in 2015 reported by the Barna Group as well as Thom Rainer's "16 Trends in American Churches in 2016"